Bet Mendelssohn in the Breeders’ Cup Classic at 10-1 with Betfair. Bet Glorious Empire in the Breeders’ Cup Turf at 25-1 with Betfair. Bet Stormy Liberal in the Breeders’ Cup Turf Sprint at 6-1 with Betfair. Bet Abel Tasman in the Breeders’ Cup Distaff at 4-1 with Betfair. The races just a month away, but there’s plenty for Breeders’ Cup betting fans to get excited about. Top horse racing betting bookmakers have early odds up, giving those who enjoy horse racing betting plenty to chew on. The Friday racing that weekend in November has been dubbed “Future Stars Friday,” which we’ve taken an early look at. Here’s some things to consider for the Saturday races. The Breeders’ Cup Filly and Mare Sprint is home to one of the shortest-priced favorites of the entire weekend, Marley’s Freedom. The Baffert trained filly has come to life this year with three consecutive Graded stakes wins since moving to his barn, but at 2-1 on Betfair it’s a tough price to swallow especially with the big payoffs this race has given us in recent years. At 4-1 on Betfair, Finley’sluckycharm is tough to pass up. She is six of seven in her starts at Churchill and will be overlooked by many given her poor run last time out. It looks as though she ran bad because of the lack of time from her prior win. Looking at her lifetime form she does well with two plus months between runs, something she’s getting going into the Breeders’ Cup. It’s crazy to look at the current market on the Breeders’ Cup Turf Sprint and see the lack of respect for the 2017 winner, Stormy Liberal. Europeans will always take money in any turf event but the gap in the market between Battaash and Stormy Liberal is wild. Stormy Liberal is riding a three-race win streak, including a recent Grade 3 win last week at Santa Anita. Drayden Van Dyke is having a career year and has ridden this horse better than anyone to date. The 6-1 odds at Betfair is incredible value on Stormy Liberal. In another feeling of shock, in recommending a short-priced Ante Post wager, I do think that 2-1 on Catalina Cruiser in the Breeders’ Cup Dirt Mile will turn out to be value when compared to his race day odds. There are no heavy hitters in this division right now and I cannot envision one appearing out of thin air in the next month. Any of the horses that could have run with him have been retired in recent months, so taking 2-1 at Betfair is not a bad approach a month out. There’s a big price to be had here. Sistercharlie is always right there, so if you can get 7-2 on Betfair in the Breeders’ Cup Filly and Mare Turf, that is beyond solid. Quidura though, who is 14-1 right now on Betfair, is sitting on a Grade 1 win this Saturday at Keeneland in the Jenny Wiley. She is also trained by Chad Brown, so get this price at Betfair before the weekend. The Breeders’ Cup Sprint has an abundance of value surrounding its division a month out. Imperial Hint is and will be the shortpriced favorite leading up to the first Saturday in November. But with proven Grade 1 sprinters at big value, I would suggest getting a price now. Limousine Liberal is fantastic at Churchill, he has won his last five races there. Also he’s 3-for-3 at Churchill on an off-track. One of the marquee races each year is the Breeders’ Cup Mile. It always seems to bridge the “turf talent gap” between the U.S. and Europe due to the distance. This year it’s tough to point towards a dominant Euro, at least right now. If you could tell me with certainty Recoletos is coming to the Mile, I would go in that direction -- two turns is something I think he would really take to. I’m uncertain about the U.S. horses, which could quickly change this weekend after the G1 Shadwell Turf Mile at Keeneland. Wesley Ward’s Bound For Nowhere put together a top performance at Kentucky Downs to win the $750,000 Tourist Mile as a follow up to a huge run at Royal Ascot in the Diamond Jubilee to finish third. He runs in the Shadwell Turf Mile this weekend and a big run will certainly cause his odds to fall in the weeks to the Breeders’ Cup. Trust Bob Baffert. It’s that simple. The Distaff division was completely shaken up over the last two weekends. The leading 3-year-old filly Monomoy Girl was handed a polarizing DQ from a G1 win, which then gave Midnight Bisou said G1 in a year-long rivalry that has been fairly one sided to Monomoy Girl. Abel Tasman then ran poorly in a G1 at Santa Anita a week later that left everyone feeling something has to be wrong with Baffert’s multiple Grade 1 winner. Because of her performance her price has drifted. Baffert has come out and said nothing is wrong with her physically after extensive exams. Mike Smith her jockey said she wasn’t herself in the warmups and that an illness had been going around the Baffert camp in recent weeks, something she showed no signs of in the days leading up to her flop. Take the inflated 4-1 price on Betfair and trust that Baffert will have Abel Tasman right come race day for the Distaff. I just cannot envision backing Enable or Roaring Lion at 9-4 on Betfair right now. Too many unknowns. Look at a horse such as a Glorious Empire, who is trading at 25-1 on Betfair and obviously completely ignored. This horse has found a home racing long distances which have equaled consecutive Graded wins. Look back to the 1998 BC Turf at Churchill, Buck’s Boy wire-to-wire, yet at a much larger price. 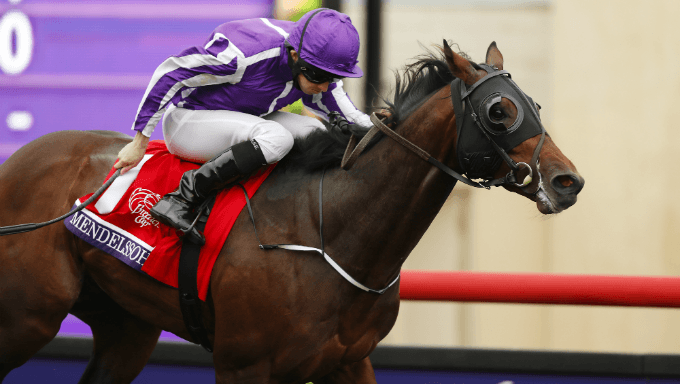 Don’t hold the Derby against Mendelssohn. Mendelssohn has redeemed himself in his recent races, especially the Jockey Club Gold Cup. He hung around after sitting next to an unrealistic pace, plus it was a one turn race. He will be far better off at the two turn 1 1/4 mile. At 10-1 on Betfair, he’s the play.